They say there are two different kinds of sins, and in all honesty, most of us pay much more attention to one type than the other. There are the "thou shalt not" sins - the things we are NOT to do (murder, covet, etc - "I don't smoke and I don't chew, and I don't go with boys who do."). There are lots of these, and most of us know what they are. Of course, there were more in OT times (at least it seems so with all the kosher issues and other such laws in the Pentateuch), but even in this age of grace, there are still plenty of things we shouldn't do - plenty of things that if we DO practice them, we are sinning. But not all sins are like this. There are some sins that come from neglecting what we should do. And sometimes we don't think about these as much. But as I was reading through the book of 1 Samuel, one instance of this grabbed me by the collar and wouldn't let me go. And it made me wonder how often I am sinning through my INACTION rather than my action. was giving a farewell speech as their official leader. 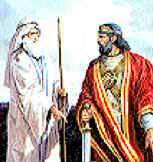 In the twelfth chapter of 1 Samuel, he told them of the mistake they made in asking for a king, and even had the Lord send down thunder and rain out of season to emphasize their error. (1 Samuel 12:12-18) The Israelites ask for forgiveness, and Samuel speaks to them of it - and then he says a most incredible thing - in my view, anyway. Not praying for the Israelites, for Samuel, would have been a sin. How often have you told someone you would pray for them and not done it? (hopefully less often than I have :::blush:::) How about that time God whispered in your ear to go witness to someone, to get off the computer and hug your child, to call a struggling friend, to pray for your enemies - and you didn't do it? Maybe you weren't just ignoring a suggestion. Maybe you were sinning against the Lord. Aren't you glad that Jesus paid the price for ALL our sins on the cross - the sins of COMMISSION as well as the sins of OMISSION? OUCH! This hurts - but it's a good reminder. Thank you. It also reminds of the verse in Psalm 139. "Search me, O God, and know my thoughts... see if there be any wicked way in me in me." Thanks for stopping by, Vonnie :)Love that verse - and the whole psalm!